The Premier Pitch @ Turf City have new pitches as well - they have already completed the 5-a-side pitch next to the existing pitches, and are laying two additional pitches across the road. I am informed they are 9-a-side (like the big one at Khalsa, which is used for 11-a-side). The 3 new Premier Pitch ones are uncovered. If the new ones by The Cage at Turf City are under a dome, then they should be covered. I await the pricing for the new pitches at Turf City. I received the attachment from The Cage by e-mail this morning. Some of you probably know about our second venue: The Cage Sports Park @ Bukit Timah. It�s located at the current Turf City. The park consists of a golf driving range, a tennis center, a baseball ground, a 5-a-side football arena and 3 x 11-a-side fields. Online bookings can be made from 14 June onwards. Click here for a work in progress layout of The Cage Sports Park. Our fields are almost ready and we are taking bookings now. The links didn't work. Anyway, no 7-a-side pitch. Picture in the attachment. There have been very few issues relating to playing at The Cage @ Kallang, so we don't have a separate thread for that venue. * We haven't managed a game at Kallang for 3 weeks now, with several other cancellations since the end of last year. I'm informed they managed to pick up 2 extra players, and played 5 v 4, off the side padding/walls as usual, with the extra player swapping sides halfway through, and the side with the extra player restricted to scoring within the penalty spot, and it worked out alright. There was no one down for last Monday (28 May 2012) by Sunday morning, so the game was cancelled. The game this coming Monday (4 June 2012) has filled up well, with even a reserve, but only shows how volatile numbers have been. It doesn't help that The Cage, like Sports Planet, give me a hard time over late cancellation. However, the pool of players who play at Kallang has grown somewhat over the course of this year, so hopefully, the game will be more sustainable in the longer run. The Cage e-mailed me a few weeks ago to say that from my next payment onwards, GST (7%) will be added to the price. I will "absorb" the GST until the end of the year, but I need to consider whether I need to put the payment for the Monday night game at The Cage up to $11 per player in the new year. I've continued to absorb the GST, which means that when we have a situation of having only 7 paying players (as we did on 21 May 2012), I am out of pocket. On the other hand, it doesn't help to increase the payment to $11 per player when numbers are still volatile. Instead, I will reduce the credit for first reports and team selectors/captains to $1 for games at The Cage. The responsibilities of being team selector/captain is less onerous for a 5-a-side than a 7-a-side. Firstly, it's easier to split 10 players into 2 teams than it is to split 14 or 16 players. For the Monday night game at Kallang, the regulars don't use the message board enough. I guess it doesn't make much difference if its $1 or $2. As for the ball getting stuck at the side between the wall and the padding, the discussion on the equivalent issue at East Coast may also apply to Kallang. 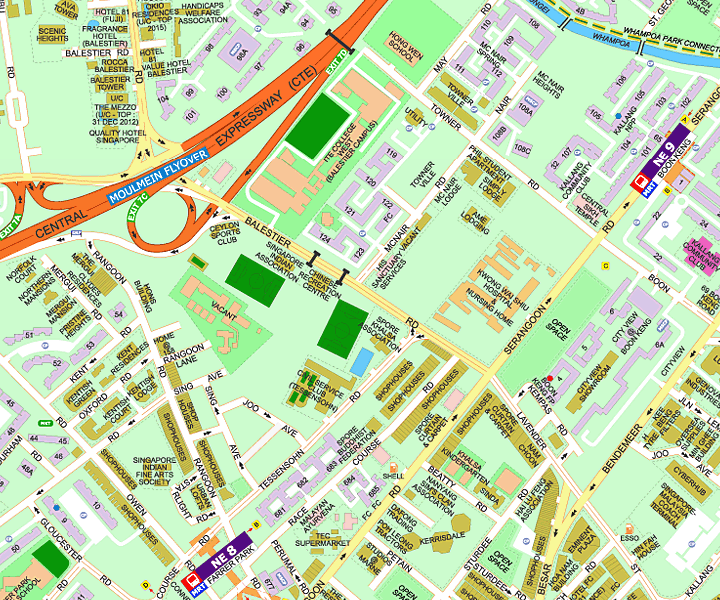 Although I told Raahol the place was close to Farrer Park Station, he looked it up on the internet and ended up at Toa Payoh Stadium, home of Balestier Khalsa. At least Raahol managed to make his way from Toa Payoh Stadium to the Premier Pitch @ Khalsa, albeit 25 minutes late. Dylan looked up Sports Planet on Google maps, and found this - a retail sports store in Kallang - and it was too late for him to get to East Coast by the time he spoke to me. If you are playing at a venue for the first time, DO NOT LOOK IT ON THE INTERNET! There are too many similar sounding places in Singapore. It's like trying to get to Raffles City and ending up at Raffles Place or Raffles Town Club, or even worse, Raffles Marina. Or just ask me for directions. At least no one playing at Turf City has ended up at Singapore Turf Club at Kranji. So far. Turf City has been renamed The Grandstand. I wonder how long people will take to get used to the new name. I'll start using the new name in the report threads, so people get used to it, before I make the change elsewhere on the message board. I haven't yet. Later in the year. Both the Saturday and Sunday game at Turf City last weekend ended up as 7-a-sides. It has been ages since we had a 7-a-side at Turf City (although we did have a 6-a-side in October 2011. I think our previous 7-a-side was before that even. All the more surprising, as we only had 1 game on Sunday, when we have had 2 games on Sunday several times over the past couple of months. Before we got 3 additional players before and after lunch on Sunday, we had to consider switching to a small pitch for the first time in years! We have quite a few injuries around, even before last weekend, but it didn't affect last weekend's numbers much. Maybe this weekend being the second last weekend of the school holidays, parents are taking the opportunity to get away with the family, with next weekend dedicated to getting children ready to return to school. Also, Sunday was Father's Day, so probably a combination of both factors. We do need to adjust our game for 7-a-side. More space, so either you have to be fitter to run more, or make better use of passing. 6-a-side on a big pitch is no longer viable, what with the increase in prices at Turf City from March 2012 onwards. If we are stuck at 12, it will have to be a small pitch. Or cancellation. For last Sunday, I put up a poll. Fortunately, it didn't come down to that. 7-a-side is actually more enjoyable. More time and space for the player on the ball, and a better workout. The weekend before last, both the Saturday game and the Sunday game at Turf City ended up as 7-a-side. .... It has been ages since we had a 7-a-side at Turf City (although we did have a 6-a-side in October 2011. I think our previous 7-a-side was before that even. Last night's game at East Coast was 6-a-side as we couldn't get to 14. We have previously discussed going ahead with 6-a-side if we're stuck at 12, but it has not happened since October 2010 (although we sometimes start 6-a-side as it is sometimes the case that a couple of players are late). Those who played last night enjoyed the game, even with 6-a-side. On 13 March 2012, they ended up playing off the side padding/fencing as usual, even with 6-a-side. I'm not sure whether they played to the side lines or off the side padding/fencing on 19 June 2012, but as there was no mention of it, I assume it was off the side padding/fencing as usual. Playing off the side lines is an option with 6-a-side at East Coast, and may make more sense, but players tend to stick with what they are used to, and it is usually off the side padding/fencing at East Coast, with 7-a-side being the norm. The more important point to make is that for each game, there is a maximum number and a minimum number (2 less than the maximum number) for the game to go on. Although we usually get the maximum number, on occasion, we only have the minimum number. The game will still go on! The Premier Pitch @ Turf City have new pitches as well - they have already completed the 5-a-side pitch next to the existing pitches, and are laying two additional pitches across the road. .... The 3 new Premier Pitch ones are uncovered. I received a telephone call from the Premier Pitch this morning to inform me that the 2 additional uncovered pitches at Turf City are ready. They are 44 m x 32 m in size (1408 m2). This is larger than the big pitch at Turf City, which is 36 m x 27 m (972 m2). The peak hour price is $250 for 2 hours, and $140 per hour. We can play either 8-a-side or 9-a-side. That would work out to 88.0 m2 or 78.2 m2 per player respectively. By comparison, a 6-a-side on the big pitch at Turf City works out to 81.0 m2 per player. I imagine we could even play 10-a-side, but I would be concerned about getting enough players. I would prefer Tuesday night, as the only game we have on Tuesday is at East Coast, but those who play at the weekends and/or Monday at Turf City might prefer Wednesday or Thursday. I suppose I could switch the Thursday night game at Khalsa to Turf City. However, that game has been filling up recently, and I imagine not all the players who play there on Thursday would switch to Turf City. If I could switch the Khalsa game to Tuesday, that might resolve the issue, but at present, no pitch is available at Khalsa on Tuesday nights. We've not been able to get a weeknight slot at Turf City before now as the covered pitch was always unavailable (as Turf City reserve pitches for their regular customers, at their regular slots). * We can stick with 7 or 8-a-side as we currently do for our weekend games. We only need 14 to 16 players, instead of trying to get 16 to 20 players. * There is no risk of games being rained out, or the pitch being wet, which has been a concern for several of the weekend Turf City regulars, who either have not tried out the uncovered pitch at Khalsa, or not continued to play there after trying it out once or twice. Am in for weekday night (Tue, Wed or Thu). Prefer earlier slot at 8pm. The Premier Pitch @ Turf City called me early last week to say that one of their regulars had agreed to try out the (cheaper) uncovered pitch last Thursday. If that regular sticks with the uncovered pitch, then the covered pitch will be available on Thursday nights longer term. They said they are liaising with both Elvin and me on the availability. I suggested they liaise with Elvin first. I understand a big covered pitch was made available to Elvin last Thursday. I believe Elvin and David T arranged a match. Anyway, I'll let Turf City sort out their weeknight regulars before I try a weeknight game at Turf City. Might take a month or two, or longer. I suppose during that time, those who prefer playing at Turf City will also have to consider what they want. As a consequence, I expect the numbers for our weeknight Khalsa games (as several of those who play at Khalsa also play at Turf City) and weekend Turf City games to be affected. In the meantime, I'll continue with the usual schedule. As always, if we don't get numbers, games will be cancelled. I think we should have the game with 12 people. East Coast is a good game for 12. It gets too crowded with 14, but then again that is my opinion. I am ok if it is 14. See you all soon. There's been a fair bit of discussion on playing 6-a-side at Khalsa and East Coast under the threads relating to those venues. Each venue has a maximum number and a minimum number. I aim for the maximum number so that the game can still go ahead even if there are withdrawals without replacements on the day of the game. Where the players are not familiar with each other, the lesser number allows more space and time on the ball, but can be more tiring. With the greater number, the game is tighter. When players are familiar with each other, it makes for a more compelling game. * If we have 28 players - both games are 7-a-side. * If we have 26 players - one game is 7-a-side, the other is 6-a-side. * If we have 24 players - both games are 6-a-side. Both games on 19 July 2012 were 6-a-side. Rajiv, speaking for the ladies, the new uncovered pitches at Turf City are very nice but could be too big at times when we don't have the numbers. You can't halve those pitches unlike the covered ones. We tried it out a few weeks ago and 2 hours can kill you even when you have the numbers! The convenience of the covered pitches is that it's possible to play just a small court when you have just 8-10 players. Protection from rain and sun is another advantage. Thank you for your continuous support towards Premier Pitch over the years. It is with regret that we are informing you, we will be permanently converting our indoor pitches to four (4) small pitches. For our affected customers who have been playing on the big pitch, we will give you first priority (subject to availability) and consideration at our outdoor pitches at Turf City and Khalsa. We will try our best to cater to all our customers’ needs and we seek your kind understanding during this transition period if there are any hiccups on the administrative side. Please do kindly inform our Centre Manager, Ms Syikin should you wish to have your bookings transferred to Khalsa or Turf City (outdoor) and she will check on availability and advise you accordingly. The permanent conversion of pitches will take place on 1st October 2012, Monday. Thank you once again for your support and we are truly sorry for any inconvenience caused. It looks like the Premier Pitch are forcing all bookings for a bigger pitch to the uncovered pitches, either at Turf City or Khalsa. There had been a lot of resistance when I suggested in March last year moving at least one of the weekend games to an uncovered pitch at Khalsa. For several, it was a matter of the location being more convenient. However, the argument that carried more weight was the pitch being covered. Since we started playing on uncovered pitches in August 2010, none of our games from 9 to 10 pm on the uncovered pitches at Khalsa and East Coast have been cancelled due rain. However, I have been observing the weather over these past two years, and it is far more likely to rain in the afternoon and evening between 4 and 7 pm, especially in the Bukit Timah area, and during the rainy season. I believe it's got to do with the geography of the area. The covered pitches that The Cage are setting up at Turf City appear to be 5-a-side as well. Being forced to play our weekend evening games on an uncovered pitch means games may have to be cancelled due to rain. I will need to review the weekly schedule. * Trying out the uncovered pitch before we are forced to move. I'm looking at starting with the Saturday game, on 22 and 29 September 2012, two weeks before we are left with no choice. * For Sunday, instead of switching immediately, try a month of old-style mini-tournaments on two small covered pitches in October 2012. * Introduce a weeknight game at Turf City. Now that all those using the big pitch are being forced onto the uncovered pitches, I have managed to get a small covered pitch on Tuesday nights from 9 to 10 pm from October 2012 onwards. I can get a big uncovered pitch, but I am concerned we may not have enough players. The big uncovered pitch will be 9-a-side, at $10 per player. If we find that it needs to be 10-a-side, I may reduce it to $9 per player. The risk is the weather - rain at any time, or hot sun at 5 pm. For the small covered pitch, it will be 5 or 6-a-side, at $11 per player. To compensate for the loss of one game on a big pitch, I also have 9 to 10 pm at Khalsa on Sundays from October 2012 onwards. I tried to get 8 to 9 pm, but it is not available. We got to 20 for yesterday's game at Turf City, so we considered playing 10-a-side on the larger uncovered pitch. Fred ... is asking if we can try a 10-a-side on the uncovered pitch. Unfortunately, the weather forecast for today is "thundery showers over many areas in the afternoon". Of course, from October 2012 onwards, we have no choice, as the Premier Pitch are forcing us onto the uncovered pitches. If we switch, for today, it will be $10 per player. Let's do 10-a-side. The forecast of rain is for north and east. Maybe good that it rain. Rain is better than haze. Besides, what is a little rain? We will all be sweaty anyway. I'll wait until 4 pm to see how the weather holds up. I've also informed the 4 reserves. If we r playing outside pitch do we get to wear studs? The rules on playing on uncovered pitches will apply. But for 10-a-side game for an hour, I dont think many would get to touch the ball much..its essentially a field game which is usually over 2 hours instead..
Can't really compare with a full field 11-a-side game as the uncovered pitches are still much smaller than a full field. A lot of reservations, including via SMS, so let's stick with what players signed up for, ie, the covered big pitch. We'll have a lot of opportunity to play on the uncovered pitch from October 2012 onwards, when the covered big pitches are no longer available. We might has well make the most of the covered big pitch while it is still available. What we had today was a foretaste of the weather watching we will have to do for the uncovered pitches. For the rest of September 2012, instead of scheduling two slots at Turf City on Sunday, from 4 to 5 pm and from 5 to 6 pm, I will schedule it as one slot, from 5 to 6 pm, with the option of switching to a 9 or 10-a-side on the uncovered pitch, subject to availability. I'm not sure whether we will settle on 9 or 10-a-side as the maximum for the uncovered pitch, but I'm willing to give 10-a-side a try. We will have to learn to deal with the weather. We can try that between November and January. I discovered over the weekend that there is an uncovered 7-a-side pitch at Indian Association (further up Balestier Road from Khalsa), run by Kickers Bay. It is cheaper, so it works out to $8 per player. I am keen to try it out. Unfortunately, there is only one 7-a-side pitch there (plus two 5-a-side pitches), and the 7-a-side pitch is only available on weekends, not weeknights. Seems TC will be keeping one covered 7-aside pitch after Sept. Rajiv, suggest we lock the Sat and Sun slots on long term basis since we almost always have games every Sat and Sun. Let us know if there is a need to change our payment modes or response times given the new booking rules. Price is still the same but early prepayment and cancellation charges apply now. I would vote for keeping our slots as it does assures us of a game, rain or shine. We have received feedback from many of you with regard to the conversion of our pitches to permanent 5-a-side pitches and we have listened. We understand your frustration of the lack of a covered 7-a-side pitch to play on, so we are hereby keeping one 7-a-side pitch. However, to ensure that this arrangement is doable, we will also require some cooperation from all of you. I've got in first for 5 to 6 pm, Saturday and Sunday, but the pitch is not available on some days. Syikin at the Premier Pitch will get back to me on that. As the 4 to 5 pm slot on Sunday has not been used much, I am not keeping that. Over the past year, we've only had 7 - on 21 August 2011, 27 November 2011, 11 December 2011, 6 May 2012, 5 February 2012, 6 May 2012, 20 May 2012 and 10 June 2012. On all occasions other than 5 February 2012 when the 5 to 6 pm game was brought forward, the 4 to 5 pm game was in addition to the 5 to 6 pm game.